We know there are a lot of parents out there who struggle with their kids being picky eaters. That’s why we have our How to Raise Healthy Eaters Series. With ideas on involving kids in the kitchen and meal formulas that end short-order cooking, your kids will learn all about healthy foods. And they just might end up finding new favorites! Of course, the journey to healthy eating doesn’t stop there, and picky eating cannot be cured overnight. So when we heard all about Crunch a Color’s 52 New Foods Challenge, we were all onboard. Even if you do not have kids at the moment, this challenge is a great way for anyone to start eating (and learning about) healthy foods. Crunch a Color was started by Jennifer Tyler Lee, a mother of two and the creator of nutrition games that make healthy eating fun for kids. Jennifer’s latest project is the 52 New Foods Challenge that is all about getting the whole family to cook together. The goal? Try 52 new foods in 52 weeks. The whole list of the new foods, as well as ton of helpful tips, can be found in her new book. We love introducing new foods to everyone in our meal plans, and it’s amazing to hear about our Kitchen Heroes’ experiences with the foods. Whether they end up liking it or not, they’re always happy that they cooked and tasted something new. Some foods on the 52 New Foods Challenge list are familiar to everyone, but it’s okay; the point is to cook together as a family, and familiar foods are a good way to ease everyone into new foods. Which is why we decided to feature sweet potatoes as our new food for this week’s recipe. If sweet potatoes are already a mainstay in your meals, then here’s a new way for you to enjoy them. And if you’re just so-so about them, this recipe might just change your mind! Sweet potatoes and eggs rarely go together, but when you add creamy sweet potatoes to a frittata, the dish is all at once rich and healthy. Even though there’s no meat, this meal will fill you right up, since sweet potatoes are high in fiber. They also add lovely color to the dish, especially if you choose the orange sweet potatoes. One of the core principles to this new food challenge is to “eat your colors,” and you are doing just that when you eat sweet potatoes. But as Jennifer states in her book, “color is key, but not just one color.” So we added some good ol’ spinach to this dish. We love to saute spinach, since it cooks down, and you end up packing a bunch of healthy greens into each bite. With such a pretty and colorful dish, how can anyone not want to take a bite (or two or three)? We sure can’t resist, and it’s a meal that your whole family will enjoy making and eating together. Keep in mind that eating should always be fun, so make it a game with the family! In this challenge, each food consists of points, and kids love accumulating their points. 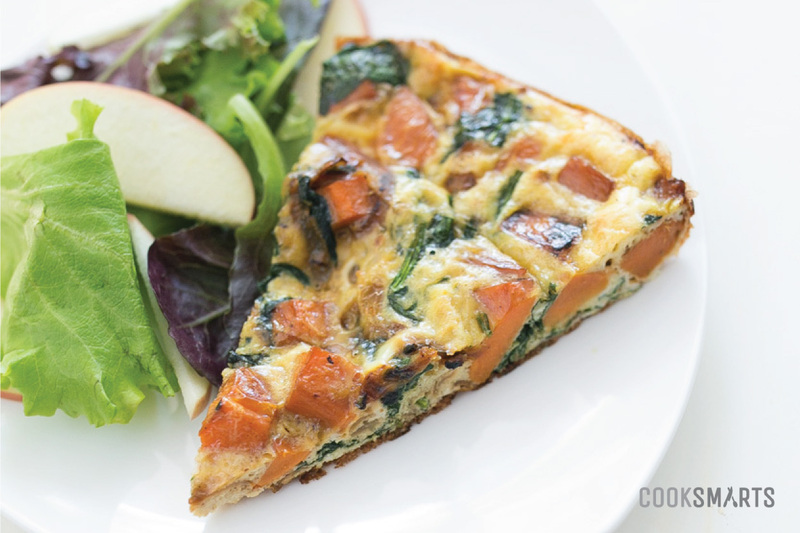 This sweet potato frittata right here? 15 points! Now let’s boost up those points (and do our bodies good) with more new and healthy foods! While little kids can whisk the eggs, older kids can help with the chopping. Watch our videos below on how to chop onions and sweet potatoes. Microwaving the sweet potatoes reduces the overall cooking time, so don’t skip this step! Frittatas freeze well, so save leftovers for an easy breakfast, weekend brunch, or to bring to a busy family. You may have never thought to pair sweet potatoes and eggs together, but creamy sweet potatoes make this frittata feel rich. We love sauteing down spinach because you pack so much healthy goodness in just a few bites. Plus, this freezes well too – perfect for a weekend brunch or to bring to a busy family. Eggs – Whisk eggs and fold in parmesan, salt, and black pepper. Place sweet potatoes into a microwave-safe dish or bowl. Cover with wet paper towel and microwave on high for 2 minutes. Heat a 9” to 10” skillet over medium heat. Add cooking oil and then onions to heated oil. Saute until softened, ~3 minutes. Next add in microwaved sweet potatoes. Saute until sweet potatoes are completely softened, 2 to 5 minutes. Add in as many spinach leaves as can fit into the pan. Add more as more space is made. Once leaves are all wilted, pour in the egg mixture. Stir until all ingredients are evenly distributed. Transfer to the oven and bake for 20 to 25 minutes, until a knife comes out cleanly. Serve frittata warm out of the oven and enjoy!